The ultra-modern high-rise Omni San Diego Hotel earns high rankings from our guests for its views and service. 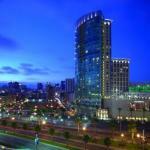 A 32-story tower of luxury the Omni San Diego boasts 511 rooms and suites with floor-to-ceiling windows offering spanning views of downtown Padres' Petco Park San Diego Bay and beyond. Accommodations are as high style as you can get â?? think sleek minimalism meets maximum comfort. Enjoy Egyptian cotton sheets fluffy terry robes DVD players and modern touches galore. Wi-Fi is available for an additional fee. The hotel houses a top art gallery and boasts a skywalk to Petco Park and popular power lunch and happy hour spots. Other highlights include a large terrace with stone fireplace a pool and hot tub and a first-rate gym and business center. Pets are welcome and valet parking is available both for an additional fee. There's also a public lot one block away. Standing at the foot of the trendy Gaslamp Quarter the hotel is directly across from the Convention Center and linked to Petco Park. From Seaport Village to Balboa Park whatever sights you want to see are an easy walk trolley hop or few minutes' drive away. San Diego International Airport is only three-and-a-half miles away.